Here’s a confession, I don’t use baby shampoo on my kids hair. I’ve been to other people’s houses with my girls on playdates and while I’m using the bathroom I’ve noticed the container of baby shampoo sitting on the side of the tub, or the primary coloured bottle of “kids” shampoo with the cartoon characters dancing across the label. Even when the girls would visit their grandmother and stay for a bath she would break out special bubble bath stuff and shampoos just for them. 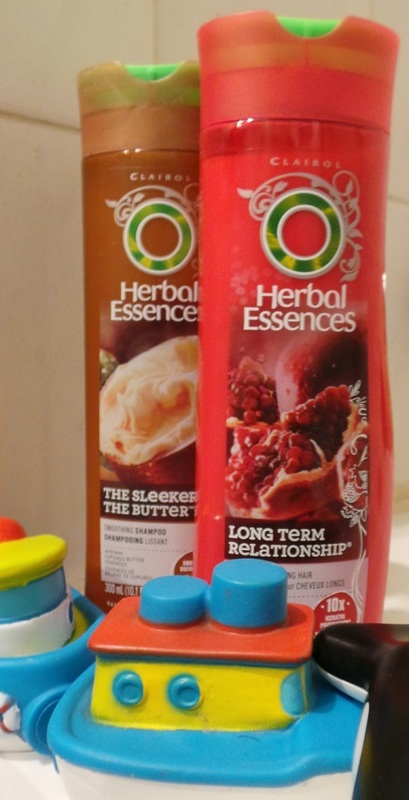 Meanwhile at home my girls have been using various scents of Herbal Essences for a couple of years now. It left me feeling like the fact that my 3 or 4 year old was actually using “grown-up shampoo” was one of my dirty little secrets. So for the past few years I’ve kept quiet about my love of Herbal Essences, because to fess up about how much I love the scent of it in my daughter’s hair would mean admitting I wasn’t doing that thing that you are apparently supposed to do, ie. use baby shampoo on your kids until they are at least 6 or 7. So here’s the truth, my admission, I use Herbal Essences shampoo on my daughters hair, and have been for a few years now. They love the fruity natural scents, and so do I. We’ve been alternating between using Long Term Relationship, which is supposed to help strengthen long hair against damage and breaks, and The Sleeker the Butter, which is meant for taming frizzy flyaway hair. Long Term Relationship smells like pomegranate and raspberries. According to the blurb on the bottle The Sleeker the Butter has the “soothing scent of cupuaçu butter”, which I find to be nutty and mellow. My kids like hugging. Particularly the younger one, who is a first class snuggler. I figure if they are going to come up to me approximately three millions times a day and smoosh their heads up against my face, I can at least enjoy the smell of nuts and berries when my nose ends up buried in their hair. Oh, but what about if they get shampoo in their eyes? Even baby shampoo stings if you get it right in your eyes, it does, (I speak from personal experience, as, yes, I’ve used baby shampoo on my hair when it was what was on hand).. For the most part I’ve mastered the trick to keeping shampoo and water out of the girls eyes while I’m helping to do their hair, but when wiggly mistakes do happen Herbal Essences is mild enough that it doesn’t irritate their eyes. A quick wipe with the washcloth and they’re good. The girls have healthy, long, sleek, hair which we get compliments on all the time. (Well okay, Rocket’s hair is a bit on the short side after she took the craft scissors to it and we had to do emergency repairs). So there you have it, my guilty secret. I almost hesitate to ask, what do you guys use on your kids hair?